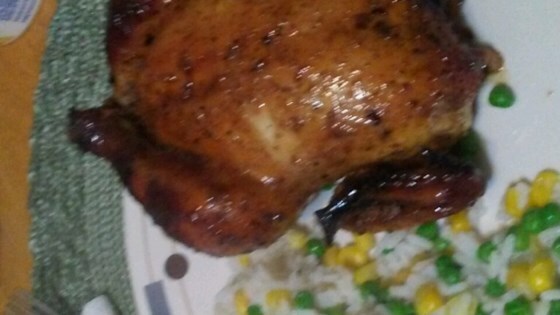 "A tasty, different way to prepare Cornish hens!" Combine soy sauce, teriyaki sauce, honey, lemon juice, garlic, black pepper, and ginger in a large resealable plastic bag. Add Cornish hens. Seal and marinate in the refrigerator for 8 hours. Preheat oven to 400 degrees F (200 degrees C). Grease a metal rack and set inside a roasting pan. Transfer hens from the plastic bag to a flat work surface; tie legs together with kitchen twine. Place hens on the prepared rack. Pour marinade into a small saucepan; bring to a boil. Remove from heat. Roast hens in the preheated oven, basting occasionally with marinade, until juices run clear, about 1 hour. Cover loosely with aluminum foil. Continue roasting until an instant-read thermometer inserted into the thickest part of the thigh, near the bone, reads 165 degrees F (74 degrees C), about 15 minute more. Cover hens with aluminum foil. Let rest for 5 minutes before serving. Delicious! Keep an eye out for over browning toward the end. The skin was tasty and crisp and the birds quite moist. a definite do-again for Me.